Andrew Hunter is a research and development chef, author, and the R&D mentor on Lifetime’s competition series, Supermarket Superstar. Supermarket Superstar was produced by All3Media America (Undercover Boss) and hosted by Stacy Keibler. It features aspiring food entrepreneurs pitching their concepts to a panel of industry experts for a once in a lifetime chance to have their creation launched nationally in a major grocery chain. As the R&D mentor, Andrew coaches the contestants, both on and off camera, to help them refine and perfect their recipes, along with the series’ mentors Chef Michael Chiarello, Debbi Fields and Chris Cornyn. Chef Andrew began his training at the Culinary Institute of America and has worked in various segments of the industry including fine and casual dining, and research and development. He currently develops retail and consumer food products for companies including Wolfgang Puck Worldwide, Niman Ranch, Martha Stewart, and Kikkoman. He develops menus and operating systems for numerous fast casual and casual dining restaurant groups. He serves as both Executive Chef for Niman Ranch and Foodservice and Industrial Chef for Kikkoman. As former vice president of culinary development for Wolfgang Puck, Chef Andrew was responsible for translating Wolfgang’s signature fine dining vision into profitable fast casual menu concepts for 90+ Express and Bistro restaurants throughout United States, Canada and Japan. 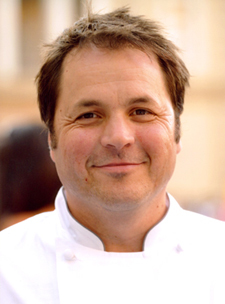 In 2007, Chef Andrew helped implement a first-of-its-kind humane farm animal treatment program created in partnership with the Humane Society of the United States. WELL, (Wolfgang's Eat Love Live) program, celebrates creating innovative tastes using all-natural, organic ingredients. Complementing Wolfgang’s culinary philosophy, WELL is the most comprehensive program of its kind ever initiated by any U.S. corporate organization. Chef Andrew earned an AOS in culinary arts from the Culinary Institute of America, a BA in culinary history from New College, and an MA in museum studies from San Francisco State University. He serves on the Center for Culinary Development’s prestigious Chef’s Council and is a member of Research Chefs Association, International Association of Culinary Professionals and National Restaurant Association. Andrew is the chef author, with cardiologist Dr. Steven Schnur, of The Reality Diet, published by Penguin in 2006. He has written numerous articles in culinary magazines including Santé, QSR, Food Product Design and Culinology. lifetime for US Special Forces in forward operating bases. He lives in Los Angeles with his wife and two children.